This lesson will have you quickly up and running and searching the database on this website. The images used in all examples are from Firefox®. This website is best accessed using either Firefox®, Chrome or Safari web browsers. All are FREE. Note that the search is CASE Sensitive. For this reason SURNAMES should be entered in ALL CAPS, whilst Given Names are entered with the first letter only as a capital. Into the Name entry box, type the first letter and wait. Depending on the speed of your internet connection you may need to wait 10 seconds or longer. You are waiting for an initial connection to the database. Once connected you should discover after the initial letter the database will respond quicker to subseqent letters. 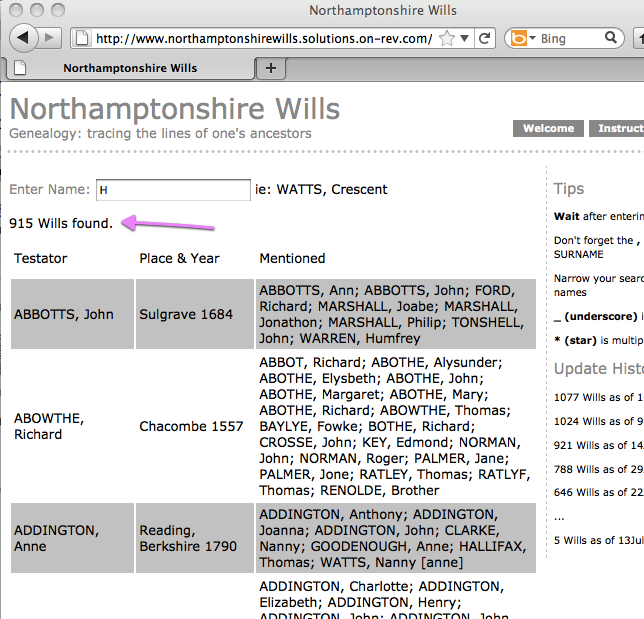 Note that the number of Wills found is listed immediately below where you are entering the Name. 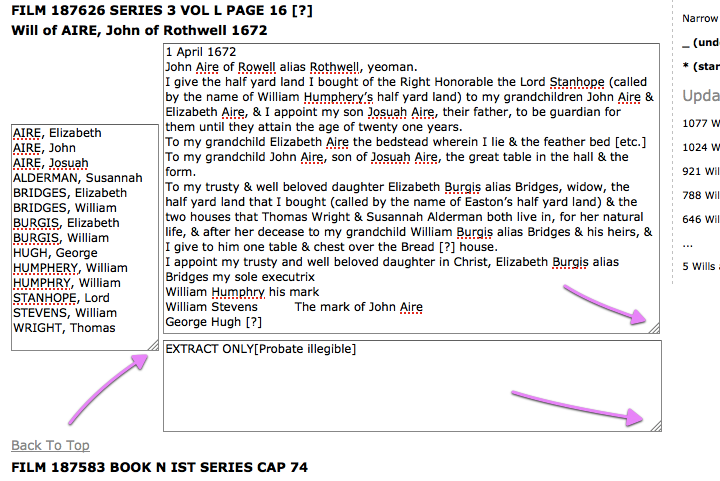 Below this the found Wills are displayed in Summary format. This is a basic format that only lists the Testator, Place, Year and the names of those Mentioned in the Will. As you enter each additional letter, wait for the database to respond. This is confirmed by observing the number of Wills found. Normally the number of Wills found will decrease with each letter entered. On the odd occasion if you have waited 10 seconds without the number changing, proceed to enter another letter. Once the number of Wills found is 20 or less, the display will change to Display format. Comments, if any, are displayed below the Will Contents. Note that the height of the fields presented is automatically based on the number of Names Mentioned. For your convenience it is possible to resize all the data fields. Click & Drag on the bottom right corner of any field you wish to resize. It has been reported that the ability to resize fields is not possible with Internet Explorer . This website is best accessed using either Firefox®, Chrome or Safari web browsers. All are FREE. The method of accessing the Place and Content Search pages are the same as above, with the following exceptions. You should search for any Names using the Name Search page, but if you must search the Content for a name, then do not use the 'SURNAME, Given' format, but rather 'Given Surname' - Note not ALL CAPS for the surname. 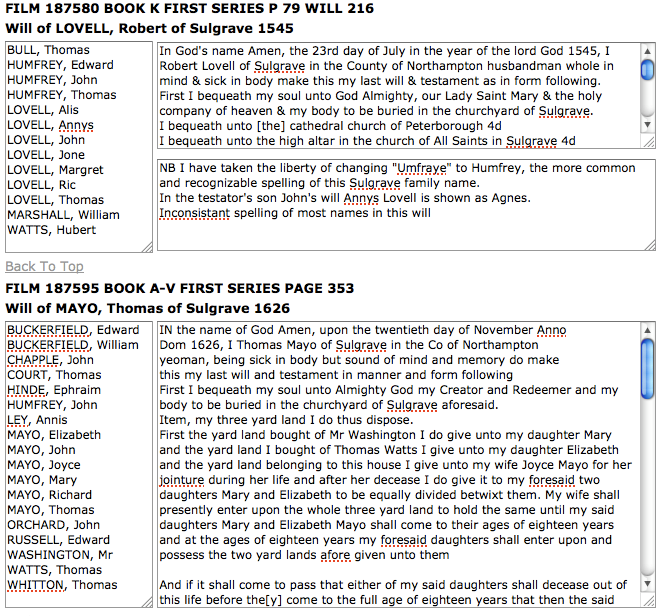 For Name and Place Searches the format will not change from Summary format to Display format until the are 20 or less Wills found. 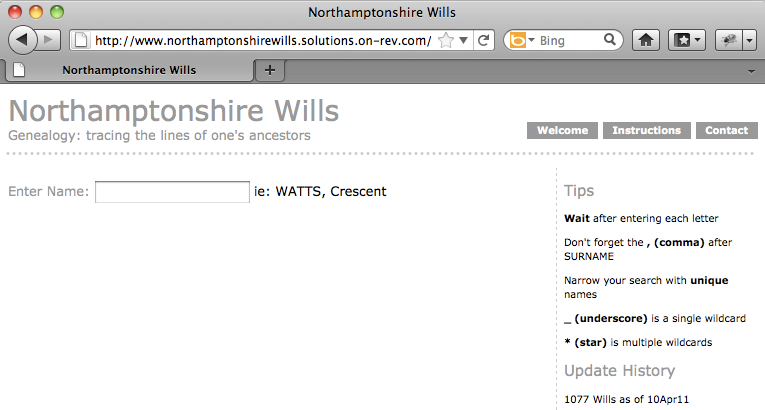 For Content Searches it is 40 or less Wills.